David McMenemy was the son of Samuel and Margaret Ann McMenemy. He was born on 20th August 1893 in Tullyhogue, Cookstown. He was one of at least eleven children, nine surviving. His father had been in the army for twenty years and had retired to be a farm labourer. David was also a farm worker. 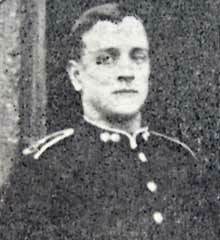 David McMenemy enlisted in Cookstown and joined the Royal Inniskillings Fusiliers Special Reserve in January 1914 and was called up on the outbreak of hostilities. Private David McMenemy was serving with the 2nd Battalion of the Royal Inniskilling Fusiliers when he was killed in action on Wednesday 21st October 1914. David McMenemy was the third son of Samuel and Margaret Ann McMenemy. Samuel McMenemy and Margaret Ann Campbell were married on 7th May 1887 in the district of Cookstown. David was born on 20th August 1893 in Tullyhogue, Cookstown. He was one of at least eleven children, nine surviving. His father, Samuel, had previously spent twenty years serving in the British Army. The 1901 census records David as 7 years old. 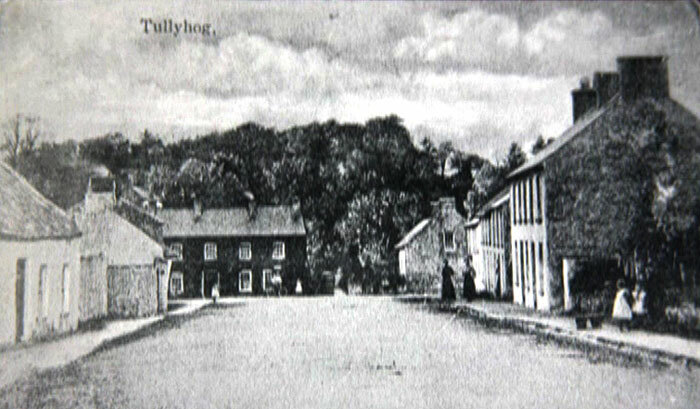 The family lived in Tullyhogue. His father Samuel was a farm servant. Both his elder brothers had left school and were working as linen weavers. Family: Samuel McMenemy, Margaret Ann McMenemy, John McMenemy (born 13th June 1888? ), Samuel McMenemy (born 8th January 1890), Margaret McMenemy (born about 1892), David McMenemy (born 20th August 1893), Robert McMenemy (born 12th January 1895), Mary Jane McMenemy (born 15th May 1896), Alexander McMenemy (born about 1898), Martha McMenemy (born about 1901), Joseph McMenemy (born 21st April 1900), Edward McMenemy (born 10th October 1902, died 1st May 1905, age 2), Charles McMenemy (born 12th June 1906). The 1911 census records David as 17 years old, living with the family at Donaghrisk, Tullaghoge, County Tyrone. David was working as a farm servant. David McMenemy was regarded as a popular young man in the district and a valued member of L.O.L. 111. David McMenemy enlisted in Cookstown and joined the Royal Inniskillings Fusiliers Special Reserve in January 1914 and was called up on the outbreak of hostilities and sent to the Western Front with the first draft. On the 21st October 1914, the 2nd Battalion were involved in a very heavy German attack which drove them back about three hundred yards. The Battalion held their position from 5.15pm to after midnight when they were able to re-take their former trench. Private David McMenemy was serving with the 2nd Battalion of the Royal Inniskilling Fusiliers when he was killed in action on Wednesday 21st October 1914. He was 21 years old. McMENEMY – 21st October. Killed in action at the front. 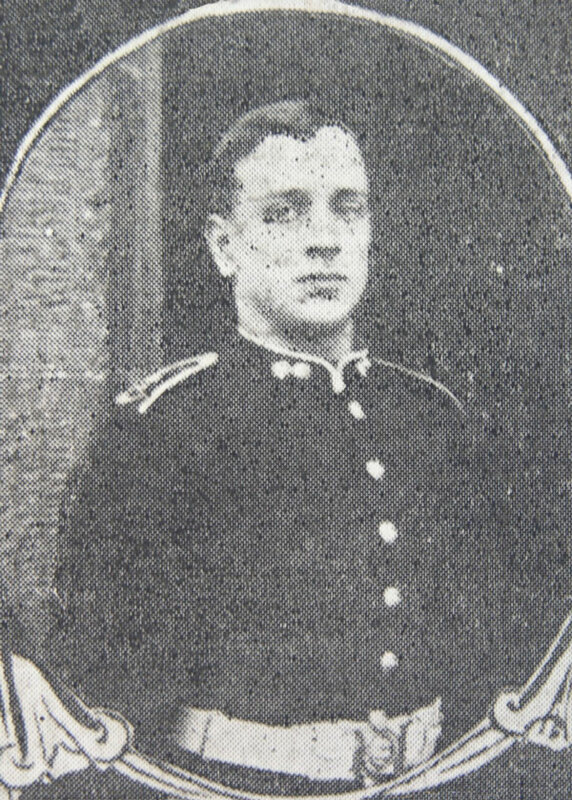 Private Davis McMenemy, of the Royal Inniskillings Fusiliers, third son of Samuel McMenemy, Tullyhogue. 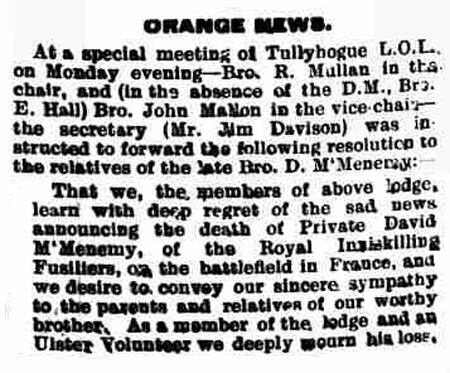 Private David McMenemy, third son of Mr Samuel McMenemy, Tullyhogue, was killed in action on the battlefield 21st October. The young soldier was only 21 years of age, and had joined the Special Reserve of the Royal Inniskillings Fusiliers in January last. He was called up on the outbreak of war, and went to the front with the first draught. Great sympathy is felt for the bereaved parents and friends. The father of the fallen soldier spent twenty years in the British Army, and three other sons are at present with the colours – Private John McMenemy, who is in Ebrington Barracks, Derry and Privates Robert and Samuel McMenemy, both in the Ulster Volunteer party at Finner Camp. The deceased, who was a member of L.O.L. No 111, was very popular in the district, and his death is deeply regretted by all who knew him. 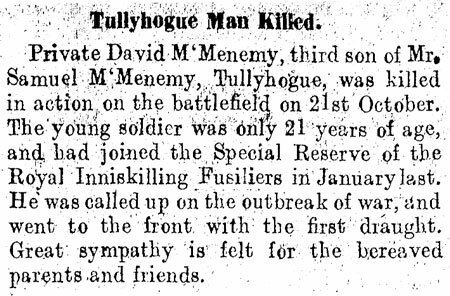 Private David McMenemy, third son of Mr Samuel McMenemy, Tullyhogue, was killed in action on 21st October 1914. the young soldier was only 21 years of age, and had joined the Special Reserve of the Royal Inniskillings Fusiliers in January last. He was called up on the outbreak of war, and went to the front with the first draft. Great sympathy is felt for the bereaved parents and friends. 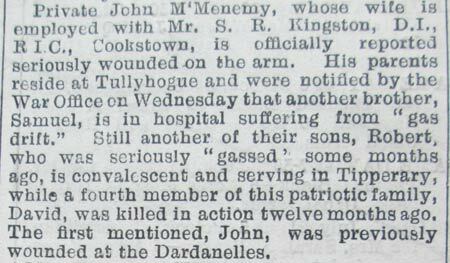 Private John McMenemy, whose wife is employed with Mr S R Kingston, D.I., R.I.C., Cookstown, is officially reported seriously wounded in the arm. His parents reside at Tullyhogue and were notified by the War Office on Wednesday that another brother, Samuel, is in hospital suffering from ‘gas drift.’ Still another of their sons, Robert, who was seriously gassed some months ago, is convalescent and serving in Tipperary, while a fourth member of this patriotic family, David, was killed in action twelve months ago. The previously mentioned, John, was previously wounded at the Dardanelles. 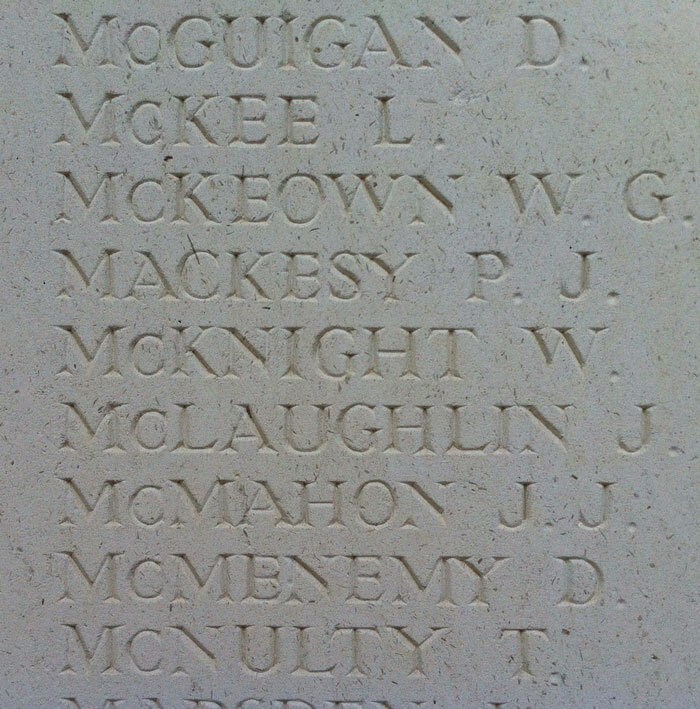 Private David McMenemy has no known grave and is commemorated on panel 5 at Ploegsteert Memorial, Belgium. He is also commemorated on Cookstown Cenotaph. Three of David’s brothers – John McMenemy, Robert McMenemy and Samuel McMenemy, also served during the First World War. John had been wounded in action at Gallipoli and again at the Somme. Robert and Samuel had both been gassed but recovered. 3 National Archives UK Medal card can be purchased here - David McMening ! !